The British Architectural Library is the centre for scholarship and care of the collections at the Royal Institute of British Architects. In this three-minute video, Harry Rich, former RIBA CEO, explains his vision for the future. Founded in 1834, RIBA champions better buildings, communities and the environment through architecture. 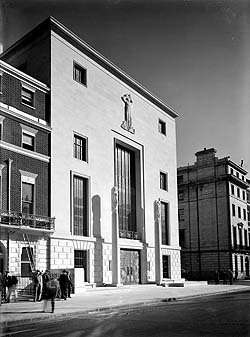 RIBA’s national center is 66 Portland Place, London, a building of great architectural significance designed by George Grey Wornum in 1934. It is open to the public and houses a lecture theatre, exhibition spaces, a bookshop and café, as well as the British Architectural Library. The public programme at RIBA, 66 Portland Place, provides a great range of talks, debates, workshops, tours and film screenings, exploring a great variety of topics and themes. You can browse the full programme on the RIBA website. RIBA provide standards, training, support and recognition for 44,000 professional members in the UK, the US and internationally, and works with the government to improve the design quality of public buildings, new homes and communities. In the US, the profession is represented by RIBA-USA. RIBA is a non-profit registered UK charity (number 210566), without government funding and with membership subscriptions and commercial activities covering only a part of the operating costs. BALTrust is pleased to join other supporters, including private individuals, foundations and companies, to care for the unrivalled collections and to share them with as many people as possible.